The first episode of Game of Thrones Season 8 had a lot of parallels and callbacks to earlier scenes in the series, in particular the first episode. Perhaps one of the most alarming images that will stick with us from the episode is the sight of poor Ned Umber, pinned to the wall at the center of a macabre spiral of body parts. It’s not the first time we’ve seen a formation like this, and it definitely has some significance. But what could it be? Here’s every time we’ve seen this symbol — or things that look like it — and what the meaning of this spiral might be. In the very first episode of the HBO series, the shape of the body parts resembled a circle with a line through it. Since then, however, the prevailing symbol has been a seven-point spiral, like the one found at House Umber. 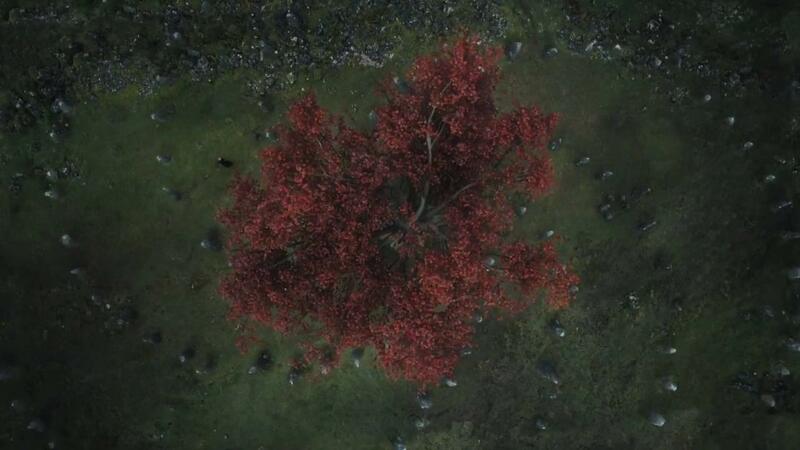 The symbol also showed up in the caves underneath Dragonstone and the stones outside the Weirwood tree where Bran found the Three-Eyed Raven and where the Children of the Forest made the first White Walker. 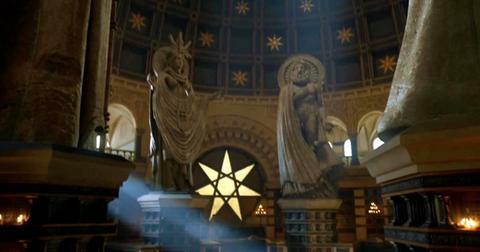 So that is the meaning of this strange spiral symbol? Clearly it means something, and fans have differing ideas what it could be. One theory is that it is connected somehow with the Faith of the Seven. The number seven comes up a lot in the show because of the dominant faith, the number of kingdoms in the realm, and the common greeting, “seven blessings.” And the spiral symbol appears to have seven spikes. A lot of fans believe this is a clue to how the Night King will be defeated — that there are seven characters who will be instrumental in ending the Long Night, and that the archetypes within The Seven point to who those people might be. 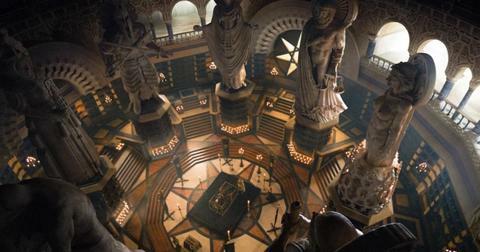 The seven gods, by the way, are The Father, The Mother, The Maiden, The Crone, The Warrior, The Smith, and The Stranger. The problem is getting people to agree who embodies each of those seven archetypes. Some are pretty obvious — who embodies “The Smith” better than master forger Gendry? Most people believe Jon and Dany are the Father and Mother, respectively, and Sansa is The Maiden, but the rest have more variance from there. Some think The Stranger is Varys, while others thing it’s the Night King himself. There’s also debate over whether those seven figures must be living or dead to end the Long Night. We really hope it’s the former. But for one fan, the latter is more likely, based on a conversation between Melisandre and Varys in Season 7. The Red Priestess said to Varys that she had to return to Westeros before she died, as did he. If she is the Crone and he the Stranger, it would make sense if her prophecy was connected to them being part of The Seven, and that they must all must die in Westeros to fulfill it — whatever “it” may be. 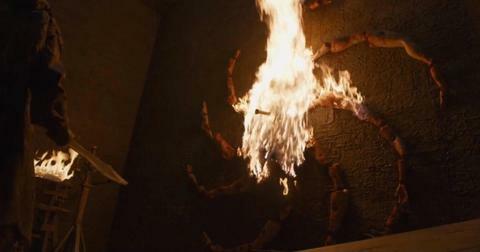 One minor issue here is that Melisandre’s religion follows the Lord of Light, who isn’t one of The Seven. But she’s done a lot of misguided things under that god, so maybe she’s about to lose her religion? The spiral may also simply mean that the Night King remembers how the Children of the Forest created him, and that it’s payback time. 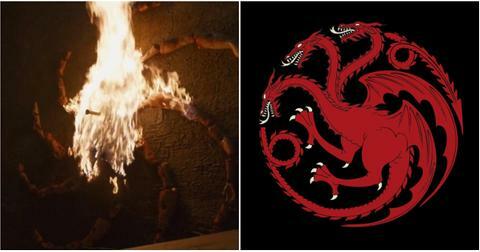 The symbol is clearly connected to the magic that made the White Walkers. It certainly seems like they’re trying to communicate a vendetta in the way they’re constructing the spiral. It is also a sign that they’re intelligent beings, not mindless zombies. 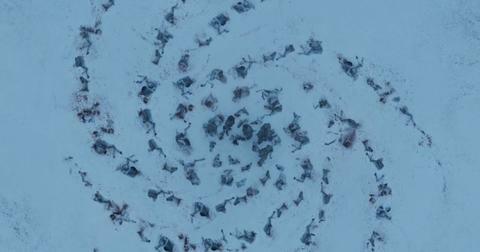 Chalk this one up to coincidence, but some eagle-eyed viewers couldn’t help notice the spiral looks a bit like a prominent house sigil: House Targaryen. Could be a coincidence, or a clue. After all, the words of House Targaryen — Fire and Blood — certainly run counter to what the White Walkers are all about. Fire is pretty much anathema to them and they don’t bleed. Since the two main heroes of our story not are both Targaryens, it’s possible they are the key to ending the Long Night — or possibly their child will be.